We’ve just opened registration for our upcoming event in Spain. Now’s the time to think about presentations you may want to bring to your fellow DNN’ers. We’ve opened up a page where you can submit proposals. Note you need to log in to be able to add new sessions. 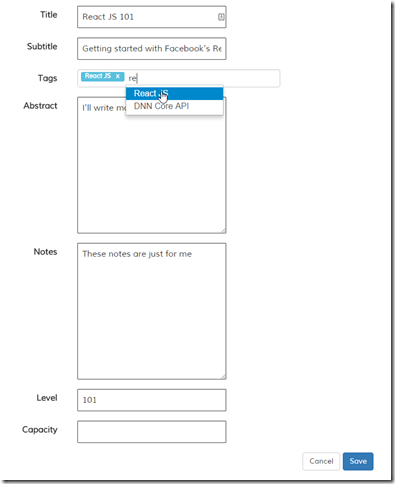 So in January of this year I sat down to recreate our Conference module using the new DNN 8 MVC pattern. 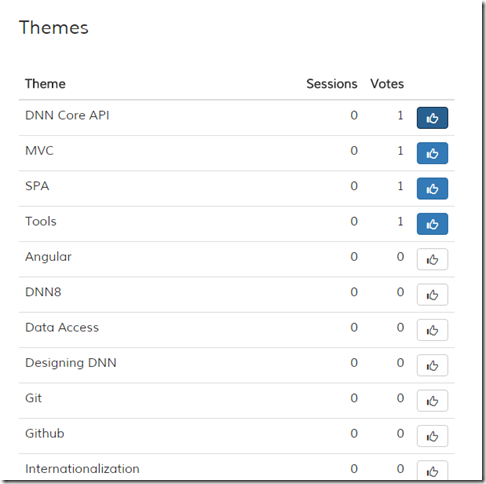 The motivation was two-fold: we needed some updates to the module and there is a module competition going on for DNN 8 MVC/SPA modules. The downside was that I was forced to dump all previous code and start from scratch. But the interventions I wanted to make were so all encompassing, that a rewrite was the only option anyway. So just before Christmas I started in earnest. One of the main goals of the rewrite was to bring in more collaborative features to the module. The module we used last year was managed by us only and it served mainly to “construct” a conference. With that I mean it was designed to store the data of sessions and speakers and spew that out onto a page on the site. A simple workflow for sessions and attendees. I.e. after submission a session is stored in exactly the same place as it will be when it is displayed in the schedule for the conference. All that happens is that it shifts from “submitted” to “accepted” (there are a few other steps as well). Comments for sessions between speakers and public. There are both private and public conversations that are kept as a log with the session. Voting for sessions and tags/themes. Last year we held a Facebook vote on subjects to cover for the conference. This is now integrated in the module and any registered user can vote for themes (used as tags for sessions) and sessions. The idea is that this helps potential speakers decide what to talk about. We’d love you to submit a session for this year’s event. Take a look at the themes on this page. Add any you miss or vote for the ones you’d like to hear more about. Look at what others want to hear more about. Is there something you can talk about? Don’t hesitate and create your own session. Once you’re happy with the abstract you can submit your session for review with us. We’ll be able to see the session at that point and give you some feedback. Finally: make sure to edit/update your profile. I’ve done my best to make it as simple as possible to add and crop a mugshot. Everything looks so much better with a little picture.